Wildwing Trail, Deer Run Trail, Fox Trail and Chickadee Loop Kensington Metropark is a 4500-acre recreation area surrounding Kent Lake in western Oakland County. It is a beautiful park featuring a paved walking/jogging/biking trail, boating access, golf c ourse, numerous picnic areas, fishing access, a farm learning center, beaches, and a nature center. 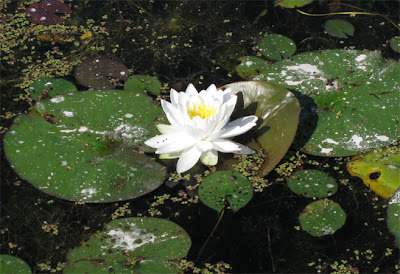 Near the southwest corner of Kent Lake and close to smaller Wildwing Lake, the nature center is the ideal destination for those looking for a quiet hike through the woods. Being an outdoor enthusiast, living in Metro Detroit has its share of frustrations. This part of Michigan is a kind of nature dead zone requiring long drives to more remote areas to achieve a decent outdoor experience. This dilemma has been a source of discontentment for me lately as I just don't have the time or desire to drive 3+ hours when the mood to go hiking strikes me. Luckily, there is a solution 40 minutes away from home for spur of the moment weekend hikes. The quiet nature study area around the nature center includes a network of 7 trails where bicycles, jogging, and pets are not permitted. The trails are short, ranging from ½ mile to 2 miles, but multiple loops can be combined to allow for longer hikes and more exercise. I arrived around 8am th is past Saturday morning and found the parking lot about ½ full. Despite this, I only encountered a handful of people out on the trails, many of them photographers crouching quietly in the brush waiting for their quarries to present themselves. I decided to begin with the 2-mile Wildwing Trail which, naturally, circles Wildwing Lake. 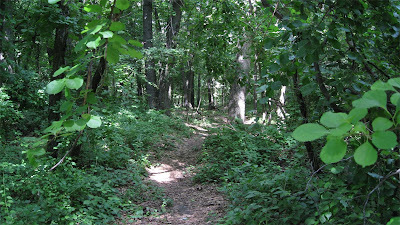 The start of the trail lead me through a sunny, swampy area before entering the woods. As I approached the trees I could hear a tremendous squawking coming from somewhere ahead of me. As I am only beginning to learn about birds, I had no idea what was making the sound, but I was intrigued. 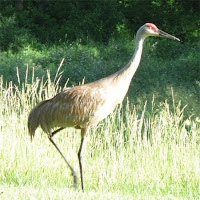 Then, just beyond the curve in the trail ahead of me, barely visible above the tall vegetation, I could see the head of a Sandhill Crane which appeard to be walking on the trail and making its way toward me. I zoomed in my camera lens and prepared for it to round the curve and come into view. Just as I was about to snap a photo, I discovered the reason for its very loud vocalizations: Another hiker was walking toward me and, against the clearly-posted rules, had a dog with her. The huge bird must have taken exception to this flagrant rule breaking and decided it had had enough. It unfolded enormous wings and took off heading directly toward my face. Although I furiously snapped off shots with my camera as it nearly took my head off, I captured nothing except blurry foliage. (The photo to the right was taken from my car, which does not count.) My disappointment was somewhat soothed as I heard the photography-ruining dog walker being reprimanded by another hiker as I wandered into the trees. Wildwing Trail alternatively winds through thick woods and marshy landscapes. 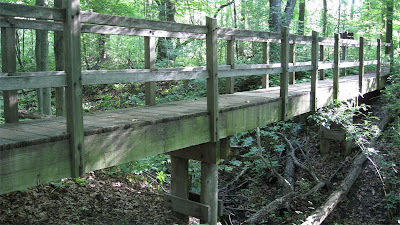 There are a few boardwalks and bridges to protect the wetter areas and various aquatic habitats. An Osprey Hacking Tower can be observed on the south side of the lake, and a long, winding footbridge leads hikers over the eastern end where waterlilies dominate the surface. Next, I decided to combine the Deer Run, Fox, and Chickadee loops before visiting the nature center, which didn't open until 10am. 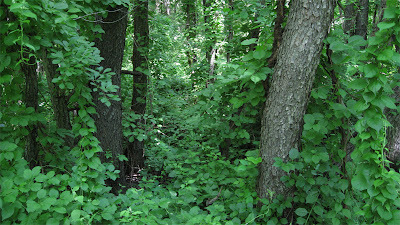 Deer Run Trail primarily circles a marshy bog type landscape where trickling water can be heard throughout the walk. Fox Trail took me over hilly terrain where evidence of glacial activity was more prevalent. Larger rocks are wedged in the earth under foot, and the occasional boulder peeks out from the overgrowth. 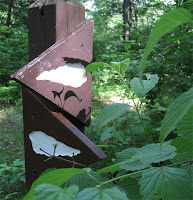 This short trail leads to the Chickadee Loop, which winds through a dense, quiet forest featuring a variety of trees, some with signs posted on them providing education regarding their type and history. At the nature center, glass enclosures display various area wildlife and habitats, and replicas of animal tracks can be studied. I am looking forward to future visits this summer as well as fall color viewing and winter hiking as soon as the snow flies. Kensington Metropark is located in Milford off I-96 (use either the Kensington Rd. or Kent Lake Rd. exit) and is open year-round. I hope all is well with you since you have been gone from the blogosphere for so long. Your trip through the woods seems enchanting. 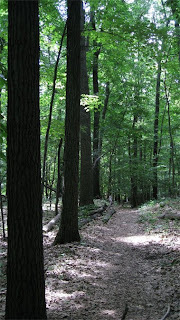 There is something about a hardwood forest, particularly after a rain, that fills the senses. We do have so many places close by, but have our own handicaps. There is one major route into the mountains and by 1:30 PM on Sunday it is already becoming a stop and go traffic jam. The press of people is getting to really wear me down. Hey Nina, what fun... have to break out the "Birds" movie. The most bothersome thing while doing any walking or hiking here in Washington and particularily Bellingham are the unleashed dogs. Most areas are clearly posted with "lease up and pick up after your dog, its the law" followed by the ordinance cited. Nothing seems to bother these laws breakers. The dogs running loose and ahead of their owners intimidate, frighten and just scare those running, walking or biking the same trail. We never know if they might knock you off of the bike, jump on you and always for sure they disrupt the peace and mental tranquility being in these areas were intended to provide. It seems most of these poeple are at least uppper middle class based on the number of high end cars they come and leave in. Very frustrating. The last time we spent the 4th of July with you was in Pekin. Or was it at "Shoto"? Have a good day and hi to sis and folks. Nice work and glad to read it. Thanks for the comment. I would love to be able to take my dog everywhere, but when virtually the entire park is dog-friendly, I would take care not to bring him to the one spot where he isn't allowed. Especially when it is a quite nature study area with nesting animals. 'Shoto' - I don't even remember that place! I'll have to look it up.